There are plenty of hostels in Paris. 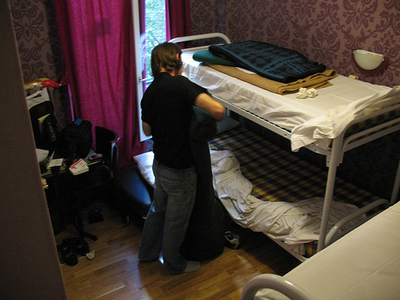 Accrueil des Jeunes en France in Paris supply hostels booking the same day. The prices are often higher, compared to directly book at the hostel in Paris and you have to go to Accrueil des Jeunes the same day as the needed lodging is needed. There are also other organizations more aimed for youth hostels, as Maisons Internationales de la Jeunesse et des Etudiants (MIJE) which arrange accommodation for persons from eighteen to thirty in three fine residences around Marais. Union des Centres de Recontres Internationales de France has nine facilities around Paris with single and double rooms, as well as dormitory rooms. Many of the facilities also have cultural arrangements and opportunities for exercising.